Most online businesses have huge workforces and their employees are spread all over the globe. Therefore, staff management can be a tough job as they have to keep track of each and every employee, the amount of work they have done, their absences, performance evaluations etc. In this situation, they need the assistance that can be offered by the Time Clock Wizard. This is an employee scheduling software that offers the advanced and essential scheduling tools needed for organizing a workforce effectively. It is fully customizable to the needs of a business and excels in various areas such as the clock feature and powerful reporting capabilities. 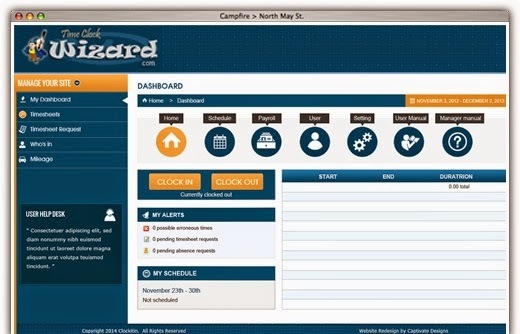 The software is immensely user-friendly so it is easy for supervisors, managers and employees to learn how to use it quickly and manage their schedules easily. It is the muscle needed by every business and individual for getting their reporting, scheduling and time tracking under strict control. One of the most noticeable benefits of this software is that it doesn’t require any installation and can be set-up immediately. Another advantage of using this program is that it can be operated on any device. This means that employees and managers both can use the program from their mobile. Employees can clock in and clock out and even add mileage before they forget. Apart from that, the Time Clock Wizard is a fully web-hosted service, which means that there is no software that needs to be downloaded. The information is stored by the Time Clock Wizard on secure servers to ensure that no prying eyes can gain access to the confidential data and information. Furthermore, daily backups are also made so the information remains updated and can be immediately recovered if there is any problem. When the data is stored on cloud, managers and employees can access it from anywhere. Weekly schedules can be adjusted online and are accessible to all employees. Effective communication is promoted in this way and chances of miscommunication are eliminated. The time clock feature of this program enables managers to see which employees are clocked in at any time. Emails can also be scheduled for informing when employees clock in and out. The program also makes it easy for workers to generate the number of hours worked by an employee and the payable wages with just one click. Payroll function can be established individually for every department, which will take into account the absences, breaks, mileage and time rounding of each and every employee. Employee absences can also be scheduled in seven different categories by managers and they can be viewed and tracked easily. Employees also have the option of adding the number of miles they have traveled on business into the program so they can be reimbursed for the expense they have borne. Managers can customize the amount that has to be paid per mile to every employee. With reliable support and assistance, this program makes your scheduling tasks go smoothly and saves you a lot of time and hassle.